Inspire students to leave their comfort zone and serve those marginalized in our society, serving another person or group of people. Create a culture where service is an expectation and part of the overall learning process. Educate students about the issues of social justice including the regional, national and global impact. Encourage students to reflect on their service work as it connects to their individual gifts, their faith, and their ability to be agents of change. Service-Learning is an educational strategy that involves students in meaningful service to their community, while engaging in some form of reflection or study that is related to the service. 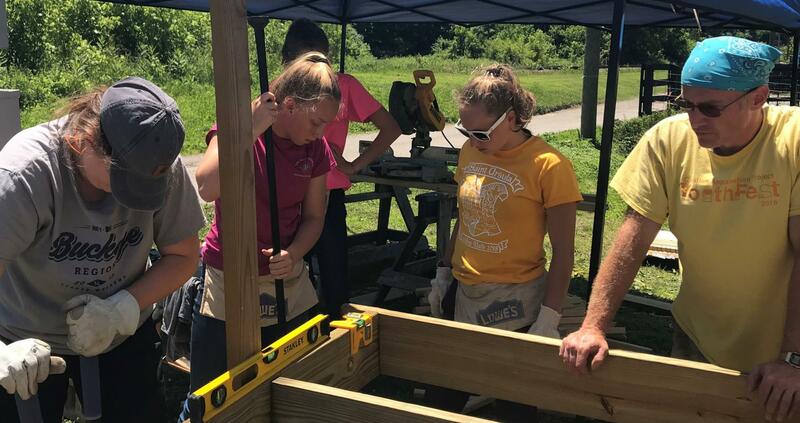 The idea is that each student would be involved in a service project that would meet the community’s needs and be integrated into the academic curriculum. At St. Ursula Academy, we are striving to have all academic areas be relevant and applicable to student life. Service Learning is one strategy to accomplish this goal. In the Social Justice Religion course, students visit service sites five times a Quarter in order to connect the Catholic Social Teachings they learn about in the classroom to the struggles of those served by various agencies throughout the great Cincinnati area. In the Art and Design Department, students connect their classroom projects with our mission collection projects and our various drives. For example, in the past, students in these classes learned about food scarcity and insecurity while creating unique “I Am” Poem Postcards. These postcards are enclosed in each family food box with a personal message in the form of a poem from the students. The family who receives the box of food can fill out the second half of the poem and send back to the student who wrote it at SUA. This is a small way in which each student can connect with those we serve. In the Math Department, classes celebrate International Pi Day by serving pies and explaining the importance of this mathematical number in local schools and soup kitchens.